It's Valentine's Day and the first in three years where the weather has been good. 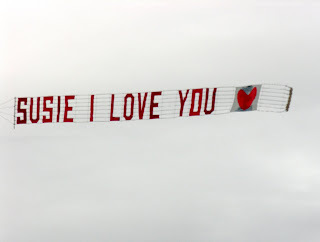 I should know, because Valentine's Day for me is normally a busy date in the flying season for my Airads business, as men - and sometimes women - all over the country propose or send special messages - pictured - to their sweethearts with a banner towed by one of my aircraft. This year, nothing! Several enquiries and for the first time an attempt to pass-off a stolen credit card for a booking. the latter attempt was almost laughable, because my 'other job', as readers may know, involves a specialisation in crime and fraud. Being suspicious about the telephone transaction for a flight over Bradford, I told the client, who was booking on behalf of someone else - sounds dodgy - I would call her back and then quickly used some subscription-based tools of my own to cross check her details, discovering that she should be 56 years old. As the caller clearly wasn't, I double checked the registered card address, found a related business telephone number and then called the real "Mrs Smith" to double check 'her' authorisation. The poor lady was really quite surprised and concerned to hear she had earlier booked a Valentine's message flight over an address in Bradford for a girl named "Jaan" and I advised the she immediately contact her bank and cancel her Maestro card; probably get on to Equifax too and make sure her identity wasn't being used for other fraudulent transactions too! I did try and warn the credit card company, after all, I had the bogus client's mobile phone number too but I if you own a Maestro card, there's no way of people like me reporting such a thing and Visa don't want to know either. It's part of the reason why credit card fraud is such big business and policing it is a shambles; there's too much of it happening and so the banks simply absorb it. However, if you happen to be the merchant involved, even if the card authorises, which this one would have done, the funds would have been reversed the moment a fraud was discovered and so its the business that loses heavily and the fraudster that wins. Ironically, the other job this week was for Greater Manchester Police with a neighbourhood policing message over the city. Card fraud aside, even my local greetings card shop tells me that while business was brisk this week, customers are seemingly more cost conscious of their choice of cards, "Me to You" love bears et al. So perhaps under Labour even the price of true love is now becoming too high, which may explain yesterday's figures that married couples are now officially in the minority; perhaps because they can't get a mortgage on the cost of the wedding.